These motorised cameras will work either on 2 AA batteries or with a standard DC adapter (not supplied) They have a built in movement detector that will activate the camera if movement is detected causing the camera to 'pan' Good deterrent. 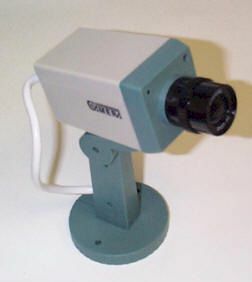 Camera measures 20cm high, supplied with rawl plugs and fixing screws. Camera also has a flashing red led built in. A new bug detector at a sensible price! just £29.95. Use this device to detect small bugging devices which are active in the room, phone, computer etc. Sensitivity adjustment, 1-200mhz range. 9v PP3 battery operated. A small basic bug ( radio transmitter) that can be hidden anywhere to discretely monitor conversations! Operates on a 9v PP3 battery, supplied complete with battery connector etc. and has a transmitting range of about 100 metres. 45x16mm The transmissions can be picked up with a reasonable FM radio. 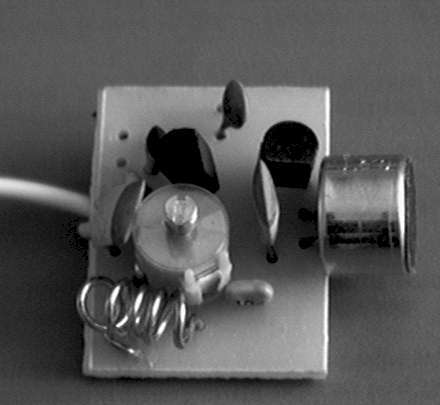 A more specialised transmitting radio bug that is only 25x20mm yet will transmit up to 500 metres and will run for several days on one battery. Surface monu components are used on the other side of the pcb. Again receivable on a FM radio. Amazing new radio bug transmits both audio and video to any standard TV! Kit contains black and white pinhole CCTV camera, mic and audio board kit, UHF video and audio transmitter board kit. 12vdc supply required. Interesting little radio transmitter for cars, boats etc. Has about a 3 mile range when installed correctly. The radio module transmits information about the vehicles movement i.e. left turns, right turns, stop and forward and runs for days on a small battery. By using a directional aerial on a receiver and interpreting the signals it is possible to track vehicles, boats etc. Just in are these new video sender kits, please note that it is not illegal to own or build but once completed it may well be illegal to own one. This kit provides you with wireless audio and visual transmission to a TV. The TV acts as a receiver, eliminating the need to buy a separate monitor. You can also hook it up to a VCR or a CCD Camera, and even set up a remote CCTV security system! Q3 VC 1 ~ C 13, C 16 and 13 all make up a colpitts oscillator circuit that fluctuates from 22O~25O MHz. You can regulate the frequency to any value within this threshold by tuning VC I or 13. C 13 modulates the signal rate. When the capacitance increases, so does the modulation. R9 and C 16 bias the local oscillation. If we lower R9s frequency to 68OR the oscillators output level will increase. Q2 and L2 act as a frequency doubler. C7, along with FCZ783R5 (IF Trans former), the Q4 transistor, C14, C19 and R12 all make up the mixer. This mixer takes both audio and visual signals together and "mix" them into one and passes through RF Amplifier Q I to transmit the signal to the antenna. 1: Turning the blue components trimmer on VC 1 varies the frequency. When we turn the trimmer, the televisions channel has to be changed accordingly. It is easier to tune the A/V Sender if you have a spectrum analyser to help you find the correct frequencies. If the frequency is tuned to 474 MHz, then this would be the equivalent of your TVs channel 14 UHF band. 2: The IF Transformer Is used to synchronise the audio and video frequencys level ratio. If the TVs image is too blurry then you can adjust the IFT to fine-tune the image. 3: SVR1 controls the video signal input ratio~ while SVR2 controls the audio portion. You can tune these components according to your needs. A range of good quality bugs and surveillance transmitters. The UTX is the smallest room transmitter kit in the world! Be prepared with a magnifying glass, a fine' tipped iron and a steady hand with this kit. The finished size including the miniature microphone is an incredible 1 0mm x 2Omm, less than half the size of a standard postage stamp. The module will operate from 3-1 2V so if used with mercury cells a very tiny package can be made making the UTX suitable for building into virtually any disguised housing. The super sensitive microphone can pick up the slightest sound at up to 25 feet and transmit the signal to a range of 506 metres. Fully tuneable from 100-116MHz covering the VHF FM band and into airband. Operating on 9V the UTX gives an output power of approximately 10mw with a current drain of 5mA. A Duracell type MN1 604 will provide about 100 hours continuous transmission. At just 1 7mm x 1 7mm the MTX room transmitter is smaller than a normal postage stamp but the extra size makes it considerably easier to assemble than the UTX, though a magnifying glass and a steady hand will still be useful. The MTX is the 'industry standard' module and can be found in many products that are sold as finished items elsewhere. A high performance electret microphone which is included in the overall size picks up the slightest sound at up to 25 feet away and the device will clearly transmit any conversations to a range of 1000 metres. A supply voltage of between 3-12V is required with the optimum being 9V. The output frequency is fully tuneable from 100-120MHz spanning both the normal VHF FM band and the airband. Operating on a 9V battery the MTX gives an output power of approximately 20mW with a current drain of 8mA. A 9V Duracell battery such as the MN1 604 will power the MTX for about 50 hours continuously. The STX room transmitter has been designed with an extra buffer/amplifier on board. This effectively increases the output power and improves the transmitter stability. The finished size of the module is just 22mm x 22mm including the on board electret microphone and with a height of just 1 5mm. the whole package is very small for such high performance results. Crystal clear reproduction of the slightest sounds up to 25 feet away will be transmitted to a range of 1500 metres. The STX will operate on a supply voltage of between 6-12V with 9V being the optimum. The output frequency is fully tuneable from 100-120MHz giving operation on both normal VHF FM or airband radios. Operating on 9V~ the STX gives an output power of approximately 50mW at a current drain of 1 5mA Typical Duracell MN1 604 will power the STX continuously for about 30 hours. If you are looking for a transmitter with a really penetrating output the VT500 will meet the requirements. With its powerful 250mW signal it is capable of excellent ranges and penetration through building and other obstacles. The complete module including the electret microphone measures just 2Omm x 4Omm with a height of 1 Smm. The VT5OO operates on a supply of 6- 1 2V with 9V being the optimum. Very sensitive audio stage coupled to the microphone ensures even the quietest sounds made up to 25 feet away will be clearly transmitted. Ranges achievable with the VT500 can be 3000 metres or more. The output frequency is fully tuneable from 100-120MHz and can therefore be used on either the normal VHF FM or airband radios. Operating on the optimum 9V and VT5OO has a current drain of 40-50mA and a Duracell MN1604 will typically provide about 10 hours continuous transmission. In the absence of any sounds or speech the VXT module lies dormant using only a very low standby current. When sounds are detected over a certain level the VXT switches on the transmitter section. Once triggered the transmitter will stay on for a preset time which prevents it from switching off during short pauses in speech. The sensitivity at which it triggers and the period it stays on are both variable with miniature on-board controls. An LED indicates when it is triggered. The VXT has incredible sensitivity, on maximum it can trigger from a door handle being operated from 25 feet away, and the on board microphone clearly reproduces any sounds at a range of 1000 metres. Fully tuneable output, from 100-120MHz covering both normal VHF FM and airband. The VXT measures just 2Omm x 67mm and operates from a 9V supply. Current drain at standby is a mere 2mA giving a standby life from a typical MN1604 Duracell battery of around 250 hours, that's 11/2 weeks! Once triggered the current drain rises to about 1 8mA giving about 25 hours continuous transmission at an output power of around 20mW. For long-term or continuous monitoring changing batteries can become a problem and mains power supplies are simply too big. The HVX4OO module has been designed to safely connect direct to a 240V AC supply live and neutral. This combined with its small size of 3Omm x 35mm and 15mm in height make it ideal for concealment into table lamps and other mains powered items. It is fully tuneable from 100-120MHz and has high sensitivity on-board electret microphone able to clearly monitor sounds up to 25 feet away. The HVX4OO has an output power of around 10mW and can transmit to a range of 500 metres. At the incredible size of just 10mm x 20mm which is less than half the size of a normal postage stamp the UTLX qualifies as the worlds smallest telephone transmitter kit. Steady hand, fine tipped soldering iron and a magnifying glass are strongly recommended! The UTLX connects to any point on the telephone line with two quick and simple connections, requires no batteries as the phone power is used and switches on and off automatically as the phone is used for incoming or outgoing conversations. Both sides of the conversation are then transmitted to a range of 500 metres with its output power of around 10mW. The output is tuneable from 100- 115MHz to span both the normal VHF FM and airband frequencies. For situations not requiring the ultimate in miniaturisation offered by the UTLX module the TLX7OO being 2Omm x 2Omm is considerably easier to assemble and has higher performance. It is the 'industry standard' telephone transmitter and this module can be found in many finished products sold elsewhere at a considerably higher prices! Power is taken from the telephone line on which it is connected so no batteries are required and the TLX7OO automatically switches on and off as the phone is used. When in use both sides of the conversation are transmitted at an output power of around 20mW which provides an effective range of 1000 metres. Output frequency is fully tuneable between 100-115MHz and can therefore be monitored either on normal VHF FM or airband. To make full use of the power available from the telephone line the STLX module employs a buffer/amplifier stage to give the maximum performance possible. The addition of this extra stage increases the stability and improves the range available which can be up to 1500 metres. Measuring just 22mm x 22mm the STLX connects at any point on the telephone line and switches on and off automatically as the phone is used. Both sides of any conversation are clearly transmitted on a frequency which is tuneable between 100-115MHz to allow monitoring on either the normal VHF FM or airband. Output power from the STLX is approximately 50mW. The STLX represents the highest performance possible from a line powered transmitter. On all line powered devices the transmitter shuts down when the phone is not in use. In the absence of a signal the radio being used to monitor will now return to the background hiss. If you are monitoring for long periods it would be useful to get rid of the hiss, it gets pretty annoying after 2 hours! It would also be an advantage to know that you haven't accidentally knocked the radio off frequency and are at that very minute missing the vital signal. This can be achieved with the PLTX module. The carrier signal from the PLTX is permanent and is transmitted constantly regardless of the use of the phone. This results in the radio being completely silent, unless mistuned, and confirms everything is working. When the phone is used for incoming or outgoing calls the audio is transmitted over the carrier signal for clear reproduction. Two simple connections to anywhere on the line are all that is required for the PLTX which measures 22mm x 22mm. To power the module a supply of 9V is required and a current drain of 8mA can be expected. An output power of around 20mW provides a transmitting range of 1000 metres on a fully tuneable frequency of 100-120MHz covering both normal FM and airband. The RVS7 has been designed to allow automatic room recording using a standard cassette recorder. It has an integral high sensitivity electret microphone which can be mounted on the board or extended up to 50 feet using suitable cable. The microphone measures just 1 0mm diameter so it can be concealed very easily. The signal from the microphone is used to trigger a very sensitive sound activated switch which then controls the recorder via the REM socket. The signal is also fed to a high gain amplifier and then out to the recorder MIC socket. The result is that the smallest of sounds will start the tape and will be clearly recorded. Once triggered the RVO7 will hold the tape running for a preset time to carry over through short pauses in speech. An on-board LED indicates triggering. The sensitivity, trigger delay and output level are all adjustable with on-board miniature controls. The RVS7 measures 4Omm x 50mm and requires a 9V supply. In the untriggered dormant mode the current drain is a mere 5mA rising to about 2OmA when triggered. From a Duracell MN1 604 a life of 100 hours untriggered or 25 hours triggered can be expected. For manual recording purposes such as in a meeting or concealing a tape recorder in your jacket the sophistication of an automatic control as provided by the RVS7 is not required. All that is necessary is to provide a strong and clean audio signal to the recorder. The internal microphones of small recorders are of very low quality, are very insensitive and being mounted so close to the mechanics pick up all the motor noise. The PKA3 uses a high performance electret microphone which can be board mounted for normal room recording or extended to 3 feet if used in a concealed body worn situation where the microphone could be disguised into a pen top or tie-clip. The signal is boosted and cleaned up before being fed into the recorder via the MIC socket. The output is adjustable with a miniature on-board control to suit all tape recorders. The PKA3 measures just 22mm x 22mm and operates from a 9V source. Current drain is just 3mA giving a life of around 150 hours from a Duracell type battery. The ATR2 measuring just l6mm x 32mm is the smallest automatic telephone recording interface kit available. Two simple connections to the telephone line, anywhere, are all that is required. The outputs from the ATR2 connect into any tape recorder via the REM and MIC sockets. It requires no batteries and draws its power from the line when the phone is used. As the handset is lifted for either incoming or outgoing calls the tape is automatically started and both sides of any conversation will be clearly recorded. When the handset is replaced the tape is stopped so preventing any tape wastage. All this is done totally silently without any indication to either of the parties using the phone. The ATR2 module is accepted as the 'industry standard' and is widely used in finished equipment currently available on the market at very high prices. For automatic telephone rec~ording on lines where there are several extensions it is often easier to install a parallel connected device such as the PTS7. This connects to the line via two simple connections and monitors the line voltage present. The outputs from the PTS7 connect to any tape recorder via the REM and MIC sockets. When the monitored line voltage drops below a preset ~level, indicating that the handset has been lifted, the tape is automatically started and both sides of any conversation will be clearly recorded. When the handset is replaced the tape is shut off preventing any wastage. The trip voItage at which the tape starts is fully adjustable with an on-board miniature control. This allows it to be tailored to any phone type. An on-board LED indicates triggering and makes setting up very easy. The PTS7 measures just 2Omm x. 67mm and operates on 9V. In its dormant untriggered state current drain is just 2mA rising to 2OmA when triggered. A Duracell 9V battery will provide 250 hours life dormant and about 25 hours when triggered. There are now many different electronic phone systems and switchboards in use in small businesses everywhere. There are many manufacturers and each has several systems. If it is required to monitor such a line and we cannot be sure of the conditions such as line voltage or switching levels then we need to find some condition which is common to all. That condition is speech or sound, If a conversation is taking place then there will be speech or sounds on the line. If the line is silent then we can deduce that it is not in use. The VSS7 connects to the line with two simple parallel connections and to any tape recorder via the REM and MIC sockets. The audio on the line is monitored and when it is of sufficient strength it triggers the tape recorder to run. An adjustable on-board delay keeps the tape running during short pauses in speech. The audio is also amplified before being fed Out to the recorder to ensure clear recordings of both sides of the conversation. The trigger sensitivity, delay and output level are all adjustable with miniature on-board controls and an LED indicates triggering to help in setting-up. The VSS7 measures 4Omm x 5Omm and operates on 9V. In the dormant untriggered state the current drain is just 4mA rising to 2OmA when triggered. A Duracell type battery will provide a life of about 100 hours dormant and 25 hours triggered. Subcarrier scrambling is a clever method of increasing the security of a room transmitter. The SCRX system first uses the audio from the high sensitivity electret microphone on board to FM modulate an ultrasonic carrier. This is then used as the signal into the transmitter section. When the signal is tuned into by the radio the output from the speaker is the ultrasonic carrier which is of course totally undetectable by the human ear. Anyone who ac~cidentally happens to tune into the signal will hear nothing and without the use of the subcarrier demodulator (SCDM) will not be aware~ of the audio that is actually there. The SCRX measures 2Omm x 67mm and requires a 9V supply. The subcarrier frequency is adjustable on-board and the output frequency is adjustable from 100-120MHz. At 9V the current drain is approximately 2OmA with an output power of around 20mW providing a range of 1000 metres. A Duracell MN1604 will provide 25 hours of continuous transmission. The subcarrier scrambling system can be extended to a telephone transmitter such as the SCLX to provide a greater security transmission. Based on the same principle as the SCRX room transmitter the SCLX converts the audio from the telephone line into an ultrasonic carrier before transmitting it. The resulting signal received by the radio is then inaudible to the human ear and cannot be monitored without the use of the SCDM demodulator. The SCLX is a line powered unit requiring no batteries and just two simple connections to the telephone line. It measures 32mm x 37mm and has fully adjustable subcarrier frequency and an output frequency variable from 100-120MHz. An output power of approximately 20mW provides an operating range of 1 000 metres. To monitor a transmission from a subcarrier transmitter such as the SCRX or SCLX requires the use of the SCDM demodulator. This takes the audio output from the headphone socket of the receiver which contains the ultrasonic carrier filters this carrier out and amplifies it up. This resultant signal is then processed to demodulate the audio from the carrier. Finally the recovered audio is fed to a small audio amplifier suitable for driving a pair of headphones. The carrier demodulating frequency and output volume are controlled by two board mounted potentiometers and the overall size of the board is 32mm x 70mm. The module requires a 9- 1 2V supply and has an audio output of around 250mW. Narrow Band FM crystal controlled transmitters, often shortened to NBFM, are the most sophisticated of all surveillance transmitters. They operate on an exact frequency and are held there accurately by the quartz crystal. The audio that they transmit is condensed down to only occupy a very small portion of the band which makes them very secure. The following range of '0' series transmitters can only be monitored with the use of the ORX180 receiver module, or a scanner receiver which covers the necessary frequency and has a narrowband capability. All of the 'Q' series transmitters operate on the 180,000MHz band although other frequencies can be supplied to special order. A frequency counter and signal strength meter, such as our FS-1, are useful although not vital, when setting up these transmitters. The QTx1 80 is a high performance NBFM crystal controlled room transmitter. ft employs a high sensitivity on-board electret condenser microphone to detect the slightest sound. The sensitivity of the audio stage can be adjusted to suit the particular application with a miniature preset control on-board. The board measures just 2Omm x 67mm and operates from a 9V supply. Current drain is 1 5mA giving a continuous transmission time from a Duracell MN1 604 battery of around 30 hours. The output power of I 0mW is sufficient for a range of 1000 metres. Operating frequency 180,000MHZ. For monitoring telephones the QLX180 employs the basic format of the QTX1 80 but has a telephone audio interface fitted where the microphone was sited. It is a permanent carrier type transmitter and is powered from a 9V source such as the Duracell MN1 604. Current drain is I 5mA giving a continuous transmission time of around 30 hours. It transmits the silent carrier at all times which keeps the output from the receiver silent when the phone is not in use. This enables VOX activated recorders to be connected directly to the output resulting in a remote recording set-up. The board measures 2Omm x 67mm and has a variable gain audio stage enabling the sensitivity of the input to be set for best reproduction. Both sides of any conversation on the line will be clearly transmitted and the output power of 10mW is sufficient for a range of 1000 metres. Operating frequency 180,000MHz. For long term telephone monitoring replacing batteries can be very troublesome and long term transmission increases the chance of detection. To avoid these problems the QSX1 80 is a line powered crystal controlled NBFM transmitter unit which requires no batteries. Power is drawn from the line when the phone is in use and the transmitter is automatically switched on and off. Both sides of any conversation on the line will be clearly transmitted. Two simple connections to the line are all that is required. The QSX1 80 measures just 32mm x 37mm and has an output power of approximately 5mW providing a range of 500 metres. Operating frequency 180,000MHz. The QX900 is a crystal controlled NBFM signalling/tracking transmitter which will find many uses in alarms, warning devices and location of missing items. It generates and transmits a stream of audio pulses whose tone and repetition rate are both variable from low to high and short to long with two miniature on board controls. ft can be fitted to vehicles or other packages whose location can then be identified with a receiver. If a directional receiver is used this can actually provide a bearing on the signal. It can be used as a wireless alarm system if linked to some form of contact and with the ability of varying the audio tones, several can be put on the same channel and monitoring with a single receiver can identify which transmitter has been triggered. Connected to a mercury tilt switch it can remotely signal if something has been moved. In fact the list is endless. The 0X900 board measures 2Omm x 67mm and the unit operates from a 9V supply. Current drain is around 10mA which will give 50 hours continuous transmission from a Duracell MN1 604. The output power of I0mW is sufficient for a range of 1000 metres. Operating frequency 180,000MHz. The TKX9OO is the broadband version of the QX900 signalling/tracking transmitter described elsewhere in this catalogue. It's output signal is fully tuneable from 100-120MHz making it suitable for use on normal VHF FM or airband receivers. The audio bleeping signal is fully adjustable with miniature on-board controls in bleep length and pitch making it ideal for all forms of signalling or alarm use. ft operates from a 9V supply and has powerful 100mW output providing a range of 3000 metres. Current drain is around 50mA so a continuous transmission time of about 10 hours can be expected from a Duracell MN1 604. Board size 25mm x 63mm. If the secure frequency of the 'Q' range of transmitters is not vital but the crystal stability is then the high performance XT89 will meet the criteria. Designed to transmit on 108.00MHz it is a. wideband transmission and can therefore be received on a normal VHF FM radio with no modifications. It comes complete with a high sensitivity electret microphone capable of detecting the slightest sound. Board size is 28mm x 85mm and operating voltage is 9V. The current drain is around 50mA giving a transmitting time of about 10 hours continuous from a Duracell type battery. Output power is in the region of 50mW giving a useful range of 1500 metres. The FM600 VHF FM receiver module is a miniature high performance radio receiver capable of excellent results. Although primarily designed for monitoring electronic surveillance transmitters it can be used as a high quality personal radio for FM stations. It can tune a 20MHz strip anywhere between 80-140 MHz and has an optional on-board dual-gate MOSFET pre- amp to really boost the sensitivity. This section can be left off the board however for local monitoring or if the extra sensitivity is not required. Coarse tuning is via an on-board variable capacitor and fine tuning is via a varicap. It has been designed to be simple to construct and requires no special equipment to set it up. The board measures just 47mm x G4mm so a complete receiver can be constructed very small. It has an integral amplifier which provides 500mW of audio to drive headphones or a small speaker. Operation is from a 9V source and current drain is around 20m A. The QRX180 is a crystal controlled NBFM receiver module suitable for monitoring any of our 'Q' series transmitters It is very sensitive and operates on a single channel frequency of 180.000MHZ although other frequencies can be supplied to special order. The construction and alignment of narrow band crystal controlled equipment is difficult without specialised equipment so to avoid this problem the complete RF front end is supplied ready assembled and aligned as a separate module. This then drops into position on the main board leaving you to construct the audio and control stages A 250mW audio output for headphones is provided by the module. 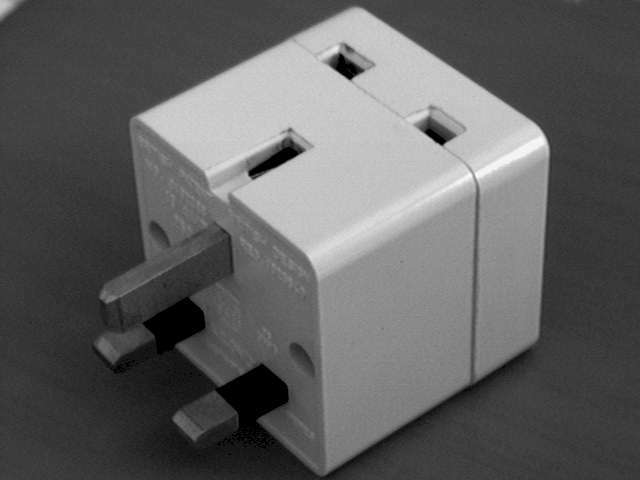 The board size measures 6Omm x 75mm and the unit operates from a 9V supply and has a current drain of around 2OmA. Although the MBX-1 is not strictly a surveillance device it still warrants description in this catalogue By connecting the MBX-1 into the headphone output of your hi-fi, tape or CD player you can transmit high fidelity music to a nearby radio. Imagine being able to listen to your favourite music anywhere round your house or garden, in the bath or in the garage! No longer will you have to put up with a DJ's choice of music and suffer the banal chit-chat between tracks! The MBX-1 combines the stereo signal input in the on-board mixer and transmits it up to 250 metres on a frequency adjustable between 90-110MHz. Its not a true stereo transmission but this has little effect on the quality. The input sensitivity on both channels is fully adjustable for the best reproduction and the overall size of the board is just 27mm x 60mm. Power requirements are 9V and current drain is just l2mA. The CD4OO is a small compact pocket bug detector unit. When it is switched on an LED and piezo bleeper pulse slowly. When it is brought into the vicinity of an RF signal as would be found near a concealed transmitter the LED and bleeper progressively increase in speed, as does the pitch of the bleep. The stronger the signal the faster and higher the bleeps which make it very easy to detect and locate any hidden signal source. The human ear can detect very small changes in pitch so confirming the location is quite simple. An on-board sensitivity control allows the gain to be successively reduced to pinpoint the source of the transmission. At maximum sensitivity a 20mW room transmitter such as the MTX can be detected at 15-20 feet. The input section is primarily intended to respond to signals relating to the majority of micro-transmitters based on 100-130MHz but it will respond to signals between 30-300MHz. The board measures 45mm x 54mm and operates on 9V. Current drain is just 5mA. The CD600 module forms the basis for a professional hand held bug detector/locator. It has two modes of operation which are indicated on the board by two LED's. In the first mode which is 'VISUAL' the relative signal strength that is being detected is displayed on a multicolour LED bargraph readout. The stronger the detected signal the more LED's illuminate. With this display is a bleeper which increases in rate the stronger the signal. This is useful when using the detector where the display may not be visible. A gain control on-board allows the sensitivity to be successively reduced to pinpoint the source of the signal. On maximum sensitivity the CD6OO can detect a 20mW room transmitter such as an MTX at 20-25 feet. Once this has been done the unit is switched over to the second "AUDIO CONFIRM' mode. The CD6OO will now use the sonic feedback system to reproduce the signal through a small speaker to indicate whether it originates from the room that you are in, in which case an instantaneous feedback whistle confirms that it is a concealed transmitter, or that it is a harmless signal from outside the building such as a passing taxi transmitter, paging system or other innocent signal. Although primarily designed to respond to the majority of micro-transmitters which operate in the 100-130MHz band the CD6OO will detect signals from 30-300MHz. The board size measures 7Omm x 100mm and operates on a 9V supply. Average current drain is 25mA. While all of our kits can be built without the use of sophisticated test and alignment equipment life can be made much easier with the use of a simple field strength meter such as the FS-1. This is a passive meter that indicates the relative amount of energy passing through the aerial. lt enables you to set devices for their maximum efficiency and to see the effect of using various settings. The FS-1 does not require any batteries and reads out the signal level on a clear and calibrated moving coil DC microammeter which is supplied with the kit. A gain control is provided to allow the device to be used on transmitters of various output powers. lt is a simple and valuable piece of equipment which will find many uses in the workshop when testing any type of transmitter. It will work with signals in the frequency range of 30MHz to 500MHz (and higher with reduced readout). The board size is 4Omm x 4Omm and the supplied meter is 50mm x 6Omm. The DLTX/DLRX system is a miniature VHF remote control switch enabling you to control anything from a distance. This could be outside lights, a[arms, hidden recorders in fact anything that can be switched electrically The system consists of two boards The DLTX is the miniature digitally encoded VHF transmitter and the DLRX which is the receiver unit, digital decoder and switching unit. The DLTX transmits a unique 8 bit security code which you set with miniature on-board switches. The DLRX monitors this signal and compares it with its own unique code, again set by you with~ the miniature on-board switches. If the codes match the output relay is energised. This has changeover contact rated at 2A. There is an option of momentary control where the relay remains closed as long as the signal is received, or alternate where the first signal closes the relay and the second opens it again. An on-board LED shows the state of the relay to make the setting up easy. The receiver section is tuned by one simple control and needs no special equipment. Although the system is intended for short range use of about 50 metres short 6" aerials on both units will produce a line-of-sight range of up to 200 metres. The DLTX measures 4Smm x 45mm and operates from a 9V supply drawing 2OmA. The DLRX measures 35mm x 9Omm and requires 9V at a standby current of 5mA and a triggered current of 30mA. Operating frequency on both boards 250-300MHz. The units are available as a pair or singly allowing more than one transmitter to be used with a single receiver. The RCTX is a remote controlled room transmitter based on the combination of our MTX room transmitter and the DLRX remote controlled receiver. The device lies dormant until it receives the special digital signal from the DLTX transmitter. When it detects this signal it switches on the room transmitter for a preset time which is adjustable up to 2 minutes. After this period the transmitter shuts down. If you wish to keep monitoring you simply keep triggering the system every time it shuts down. The on-board room transmitter has a very sensitive electret microphone and will clearly detect sounds up to 25 feet away. The RCTX board measures 35mm x 9Omm and operates from a 9V supply. On standby the current drain is 5mA rising to 1 5mA when triggered. The unit can be triggered from up to 200 metres and the output from the room transmitter of around 20mW can have a range in the region of 1000 metres although there is little point in monitoring at a greater range than the unit can be triggered. Operating frequency of control signal 250-300MHz. Output frequency of room transmitter 100-120MHz.